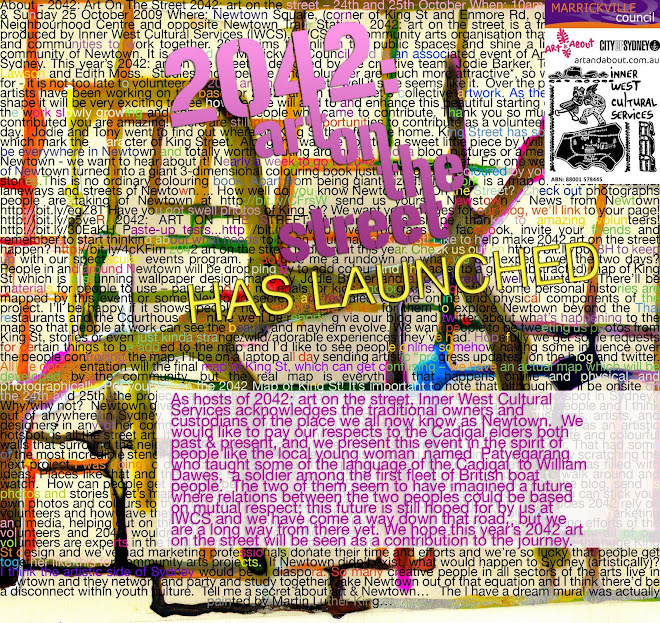 Like to help make ‘2042: art on the street’ happen? We are looking for creative people to help straight away to create wallpaper paste-ups. Tasks – screen printing; cutting paper stencils; arranging and gluing shapes onto paper to create wallpaper. Work with artists Collider and MKSHFT in a workshop environment (just off King St). If you can spare a couple of hours or a day, every little bit helps; we’d love to hear from you! Send your contact details, a brief line about yourself to Camilla at info@innerwestcs.org.au or phone: 9550 4156. We value your support. Your contribution will be posted on the 2042 website and you will go into the draw to receive an original and unique 2042:art on the street T’shirt. STAY POSTED.. we have a number of other VOLUNTEER AND PAID POSITIONS AVAILABLE during the festival weekend ... for more details email info@innerwestcs.org.au. What Does Your King St Look Like?